Let's make it a permanent brake. Get out of the EU. The British people have never voted to have their country colonised by millions of European immigrants. They never voted to join, or remain a member, of the EU. We should leave the EU immediately, I and all my friends and family agree with the former post, we did not vote to have our Country colonised by millions of European Immigrants. How much more can this country take when its Government slags its own people off, branding them lazy, while our streets are full of East European beggars and Pick Pockets. The country has been ruined and is not the same country it was. Which is the reason UKIP is doing so well. Some areas are full of Polish shops, why are councils allowing this to happen, this is supposed to be Britain. I could go on and on, just like everyone I meet does, people are sick to death of it and it is only a matter of time before something happens as we are at bursting point. 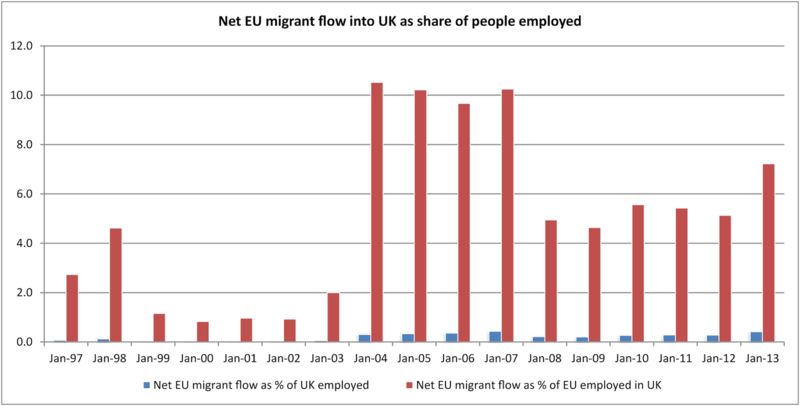 "However, restricting EU migration to certain areas of the UK would be very difficult to administer in practice"
"1. Freedom of movement for workers shall be secured within the Union. (b) to move freely within the territory of Member States for this purpose ..."
When a test case was brought before the eurofederalist lawyers on the ECJ, as it would be, I think it would be difficult for the UK government to justify a policy of allowing British workers to move freely around the UK, as well as to change their occupations, while attempting to restrict each worker from another EU member state to a certain occupation in a certain location. THE US & GERMANY ARE RELYING ON IT TO SAVE THEIR FAILED ECONOMIES. THE TTIP IS FRAUGHT WITH DANGERS THAT HAVE NOT BEEN "ANTICIPATED"
GREED & THE DESIRE FOR QUICK & EASY FIXES ALWAYS LEAD TO EVEN BIGGER / INSURMOUNTABLE PROBLEMS & ULTIMATELY BLOW UP IN ONES FACE. THE TTIP AGREEMENT IS A TIME BOMB TICKING. Rather than describing Dave's wafflings as a possible temporary brake, I think that a comparison to a temporary dam would be more apt. We all know what happens to flood waters when a temporary dam is removed and given the EUSSR's lamentable economic policies there is no reason to suspect that the flood waters will subside in the foreseeable future. So, a short term dam or brake is of no real use and a long term one would not be permitted by the commissars in Brussels (and it would appear, many of the UK's 'friends' in Eastern Europe such as Poland and the Czech Republic). So it follows that the only way to stop the flood permanently and for Dave to keep his job is for the UK to leave the EUSSR altogether and the sooner that Dave finally works that out the better. David Cameron and his cowardly false Conservatives and Ed Miliband and his confused Labourites will NEVER - as in NOT EVER - do anything which may cause the EU Commission to open its vaults and expose the extent of their compromise. That the UK will leave the EU is a given. It is not in doubt. But it will be the people of the UK - sick and fed up with EU Controlled Political Parties like Labour, Conservative and the despicable Libs - who will take it out. It is why UKIP exists.